I Had To Do It!!!!! So I was looking through my photos in iPhoto and I came upon my pictures from a recent trip to the Bay Area while visiting family. (Miss you all and the Bay!) There were those very common vacation pictures like pictures with family, pictures of landmarks, food that you may have eaten at a restaurant, etc. But the moment I saw these set of pictures, I just knew I had to post it up here…. One thing I love so much about the Bay Area is that there is a pretty large Filipino population. I am so, so proud to say that I am 100% Filipino, so I always feel “at home” whenever I go down there, solely for the fact that I was born there and that there are so many Filipinos there that it’ll make you feel like you’re actually in the Philippines. And I have always believed, “Where there is a lot of Filipinos, there is even more Filipino food!”. And let me tell you, there was SOOOO much great Filipino food around and it made me a very happy guy. I have a lot of thoughts about Filipino cuisine, but thats for another post coming soon…. This post is primarily about one specific type of Filipino food. 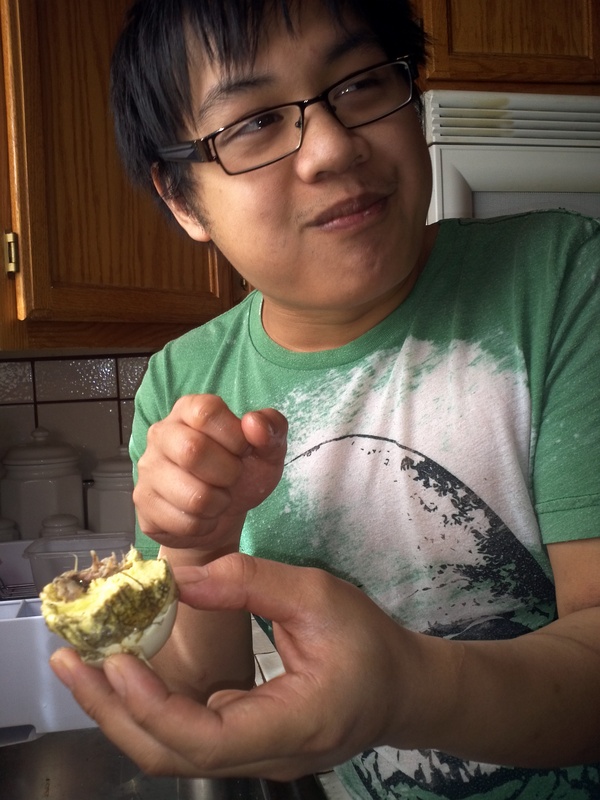 Probably one of the most talked about Filipino ever, Balut! That ain't no regular hard-boiled egg! For those of you who aren’t of aware of what Balut is, let me break it down to you in the simplest form ever. Boiled 19 day old duck fetus. Well… give or take a day. But still… Doesn’t sound (or look) like the most appetizing ever. Surprisingly, it is a very popular street food that is quite accessible at any Filipino Market. My heart was pumping, my hands were sweaty, but I just knew….. I had to do it! The funny thing is that this was my second time doing it! 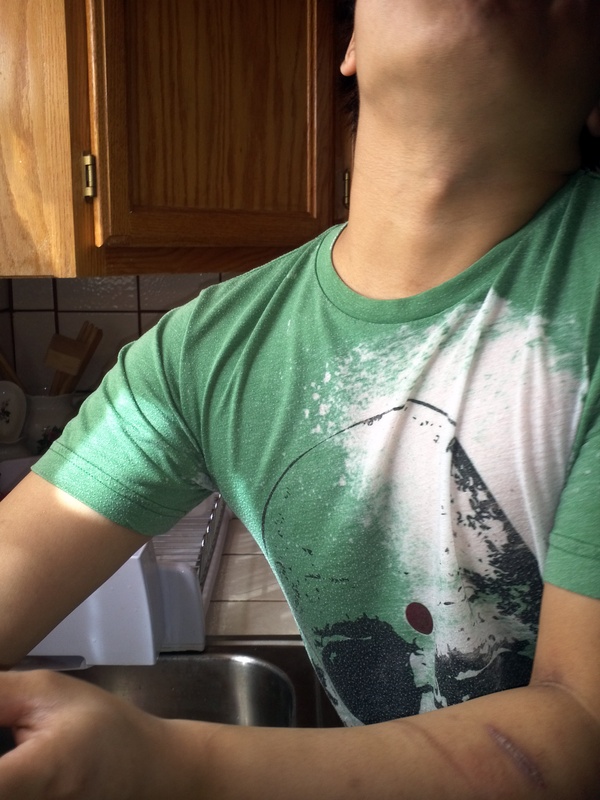 But still, even thinking about eating Balut still has got my stomach turning in knots. 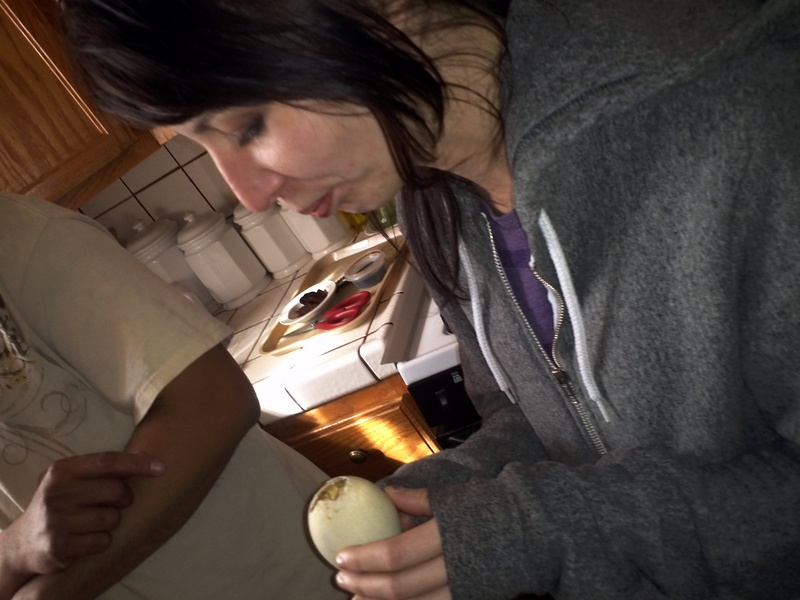 Staci's first crack into the egg! So I took my warm egg from the brown baggie and had started it the way I was always taught. Crack a hole in the roundest side of the egg and carefully peel the egg shells away from the bottom of the egg, exposing a “hollow” spot from an air pocket that is created when the duck is cooking. When you look into the hole you have created, you see some liquid that rests atop what looks to be an imploded-overcooked hardboiled egg. But its not…. its the duck (Gah!) The liquid in the egg is meant to be sipped out before you peel the rest of the egg to the real good stuff. The ‘broth’ actually has a large amount of flavor. It tastes like a very gamey, intense duck broth, that is at the same time, pretty light. Add a dash of vinegar, and you get a whole different complexity of flavors that I can say I actually quite enjoyed. Staci Modeling the exposed fetus. Spoiler alert.. SHE DIDN'T EAT IT. Next, came the exposure of the duck. 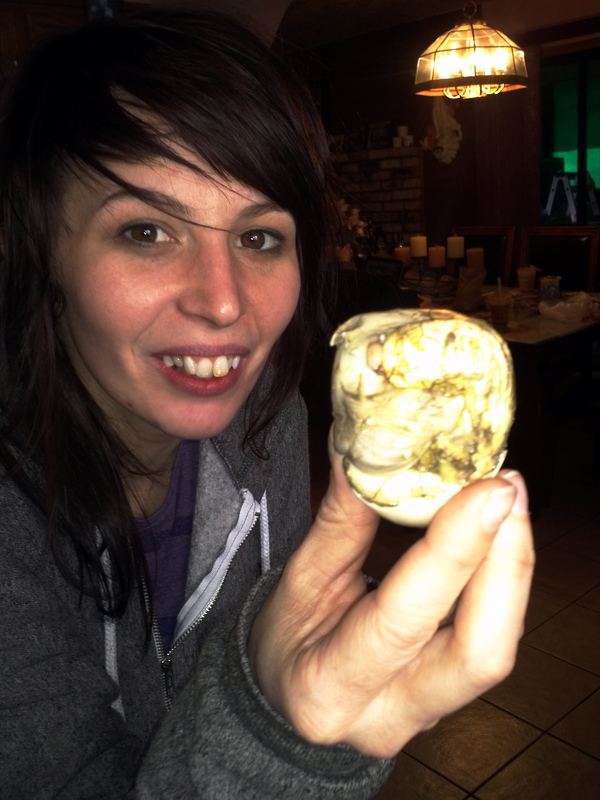 I carefully peeled the rest of the eggs shell off of the poor, poor duck and then looked at it…. and looked at it… and looked at it… It wasn’t until another minute when my cousin finally grew impatient and was like, “Are you going to do it or not!! C’mon dude!” It was time. It was now or never! So I sprinkled a good amount of sea salt onto what I think was the thigh of duckling (I couldn’t tell what I was looking at actually, it just looked like a mess!). And I took a bite. A HUGE bite. I bit off more than I could take…. Literally. I remember not being able to open my jaw after the first initial bite because of what was about to come after. I closed my eyes to hide back the little tear I knew was trying to escape and then took another chew. *CRUNCH*. Oh my god…..* CRUNCH* Yep, thats a beak… *CRUNCH*… And there goes the back bone… It was one of the most excruciating 4 minutes of chewing in my life. And this was the only the first bite. 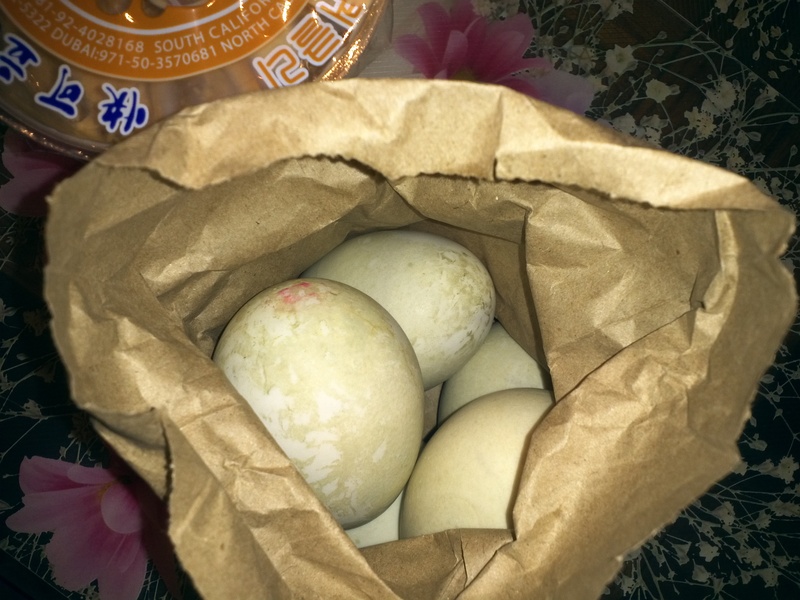 They recommend eating the whole Balut in 2 bites. Why 2 bites? I really don’t know. Maybe so you don’t have visually feast your eyes on the fetus to make your experience of eating baby duck fetus a little bit more enjoyable? Who knows. 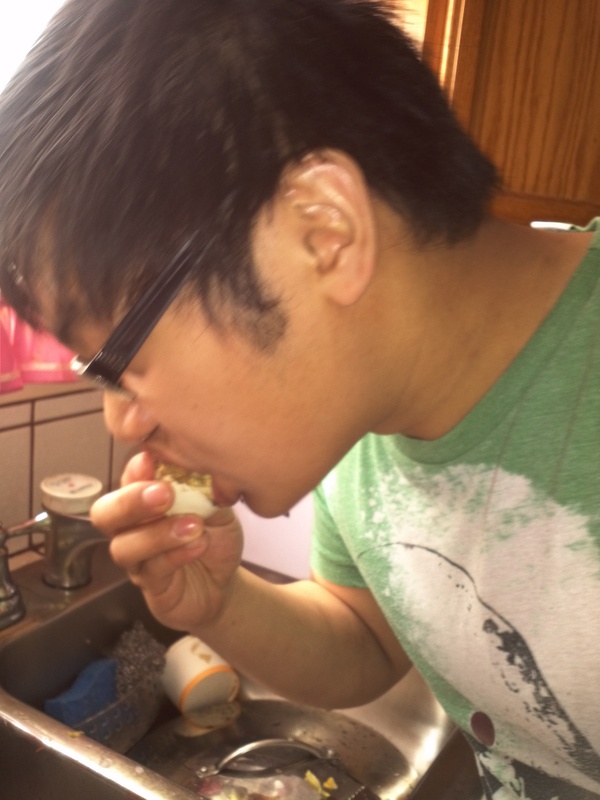 All I got to say is that regardless of all the displeasing things I have had to say about Balut, I actually had a real good time eating it. 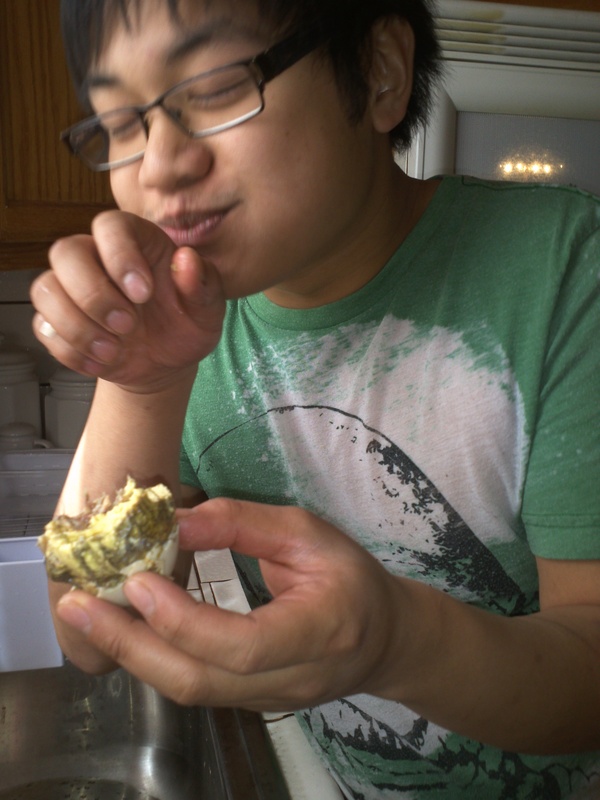 The flavor of the Balut itself wasn’t that bad, it was quite good actually. It just tastes like a very flavorful hard-boiled duck egg mixed in with duck liver and had some meaty texture that you’d expect from cooked quail. But with the addition of the crunch bones and the edible beak, head, brains, and feet, I think that is what really is the deal breaker for this Filipino delicacy. "Oh my God, why did I agree to do this!?" Thanks for reading! Until Then….